A Chickenosaurus, a Salami, and an MS Patient Walk into a Bar. . .
After reading ominous, apocalyptic articles about global warming, hurricanes, mass shootings, and now a study released by the World Health Organization (WHO) claiming that processed red meat is as dangerous to humans as tobacco—a year-old article appeared in my newsfeed about the plausibility of creating a chickenosaurus within the next five years. I smiled gratefully at this shot of whimsy amid the news page doomsday prophesies. If we do survive all the natural disasters and civil violence, wouldn’t it be a kick to have some toothed, clawed and betailed poultry running around the backyard? Naturally I was intrigued. I already knew that JURASSIC PARK was mere science fiction, that dinosaur DNA contained in fossil bones is too decayed to be used to clone a new herd of scaly little nippers. Does this mean science has solved that problem? Interesting, but what does this have to do with multiple sclerosis? 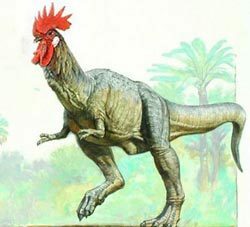 I’ll let paleontologist Jack Horner trot out the details of creating a dino chicken and then we can try to connect the dots. From a November 16, 2014 metro.uk article by Rob Waugh: “Paleontologist Jack Horner proposed the idea of the ‘chickenosaurus’ four years ago in a TED talk – and has already created strange, hybrid creatures with crocodile-like teeth and lizard-like snouts. He says he can ‘finish the job’ with a dinosaur that acts, walks and looks like a dinosaur – but hatches from a chicken egg… Instead of finding perfectly preserved DNA in amber, as in the Jurassic Park films, Horner proposed reactivating ancient DNA in chickens to give the creatures dinosaur-like features such as a tail… Horner – a world-renowned paleontologist–… hopes that his research will lead to breakthroughs in human medicine. Very science fictiony—and yet somewhat familiar language to those of us who read about gene therapy studies for cancer and autoimmune diseases. But it’s Horner’s concept of stepping inside a molecular time machine and recapturing an older, ancestral version of a bird’s dinosaur-ish cells as a means to an end–hatching a dinosaur in a chicken egg—that resonates, that makes me imagine some version of it for a multiple sclerosis cure. Could we dial back our genetic codes to an earlier epoch in which specific mutations hadn’t occurred yet? It sounds similar to the copy machine analogy, where each time our cells replicate, it’s like making a copy of a copy. The quality of these copies deteriorates over time. So restoring an earlier version of a gene might be akin to sorting through a stack of fuzzy copies and finding the clean, crisp original. It’s fun to imagine a future in which I am cured of MS and have an exotic new pet: A chickenosaurus that patrols the fenced perimeter of my backyard. Oh, and another breakthrough in this future utopia? The genetic time machine has also modified my gut genes so I can eat as much salami as I want without risking cancer, stroke, and coronary artery disease. Bring it on, science geeks, and the sooner the better. If I have to drink one more veggie smoothie, I’m gonna plotz.